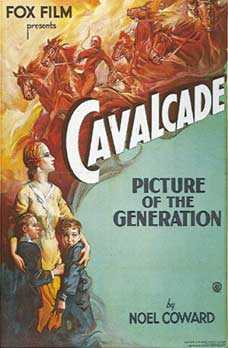 Cavalcade is a 1933 American Pre-Code drama film directed by Frank Lloyd. The screenplay by Reginald Berkeley and Sonya Levien is based on the 1931 play of the same title by Noel Coward. The film won three Academy Awards, including Best Picture and Best Director. Offering a view of English life from New Year's Eve 1899 through New Year's Day 1933, the film is presented from the point of view of well-to-do London residents Jane and Robert Marryot. Several historical events serve as background for the film, including the Second Boer War, the death of Queen Victoria, the sinking of the Titanic, and World War I.